Because I am a new homeowner, I still am constantly finding new home decor or improvement projects and ideas, especially because of Pinterest. One such find are beautiful Polish Pottery pieces, which can get quite pricey. The Polish are well-known for their pottery pieces, and they can become valuable collector's pieces or family heirlooms. Thanks to the internet, sites like Polish Pottery Store make finding the most reasonable prices on Polish pottery a reality. 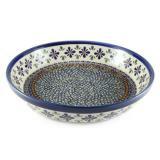 I really love this Polish Pottery Bowl (pictured in this post), and the website helped me find it for around $60. What a great deal! We have glass cabinets at our house, so this would look great in those. Next time I need some more Polish Pottery, I'll certainly check out Polish Pottery Store again!